Popular music can be a funny thing. For a period of time, an act can be the biggest thing going—you see them on TV, hear them on the radio and their name just seems to pop up in everyday conversation. Sometimes though you can fast forward five years and no one remembers their name. Today’s band was one of the most recognized acts of the ‘70s, but appears to be lost among the current generation. Karen and Richard Carpenter hailed from New Haven, Connecticut—with Richard born in 1946 and Karen in 1950. Richard was fairly introverted, often just sitting in the house listening to records and playing the piano. Karen on the other hand, was quite outgoing. She was active in sports, played with the neighborhood kids, but shared a bond with her older brother over music. It was not uncommon to see them sitting together next to the record player listening to their favorite tunes. In the early ‘60s, the family would move to Downey, California, near Los Angeles. Richard enrolled at Cal State Long Beach, where he met a couple guys and started a band. Karen found a knack for playing the drums at her new high school, eventually getting a professional grade Ludwig kit and becoming an exceptional drummer. After a couple other bands and almost a decade, Karen and Richard decided to break off into their own group and began creating demo tapes. The owner of A&M Records heard a demo and immediately signed them, feeling Karen’s voice was unlike anything he’d ever heard. Needing an official name, they went with Carpenters – being their last name and leaving out a “The” because it sounded much hipper. 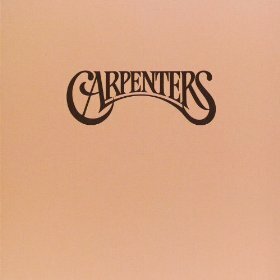 Today I’m listening to their third studio recording, simple titled Carpenters which was released in 1971. This release marked big changes for the band: Karen began singing at the front of the stage instead of behind the drums, it was the first record to feature the new Carpenters logo, and it was shelved with an all tan cover, mimicking the Beatles “White Album.” Because of that, this is often referred to as ‘The Tan Album’ in music circles. Some critics felt this was a bit of a let down from their prior release—which was named to Rolling Stones Top 500 of all time—but the numbers tell a different story. This was the Carpenters highest selling album of all time, with nearly 8 million sold. The popularity of the single “Superstar” is still their most played single today. As I understand it, the Carpenters were everywhere back in the day. In a 14 year period, they recorded 11 albums, charted 31 singles, had five television specials and even spun a television series. They set the bar for easy-listening, soft rock, and redefined the adult contemporary genres. I’m a big music nut and I can safely say, save the hits, this just isn’t a band that has come up much in my life. Sonic Youth did a remake of the hit “Superstar,” and that truly may have been my first real introduction to the band. All that aside, there’s no denying the songwriting talents of Richard and the vocal ability of Karen. They complemented each other so well, and the arrangements of this album are quite outstanding. It sounds so polished and professional, as though they spent a whole life making music together. Sadly, Karen passed away in 1983 at age 32 due to heart failure. She had been battling anorexia for some time, and her death became a national caution against the disease. Raise a glass to Karen today—and pick this up for $5 bucks. I’m not sure you’ll find a better soft rock album to put on today. Carpenters’ breakthrough hit, “Close to You” was written by Burt Bacharach and Hal David and recorded, originally, by Richard Chamberlain (yes, Dr. Kildare!) in 1963. The song was recorded by different artists in the mid and late 1960s before presented to Herb Alpert (the A in A&M Records) as a potential follow up to his #1 hit “This Guy’s in Love with You”. Fortunately, for Richard and Karen, the latter occurred and one of the most successful soft rock acts of all-time found their sound and audience. Wow, great info Mike! There’s a lot for me to learn about the Carpenters – I really need to look into more of their albums. Thanks for the comment!